In the run up to Christmas there's the usual jostling among publishers to have the best-selling book of the year. Apparently the first Thursday in October is the optimum time to publish your little gem and get maximum exposure / selling time in the run up to Christmas. This year all that meant some 800 books were published on Thursday of this week. So please spare a thought for booksellers all over the country who've been struggling with a hideous amount of work that all needs to be done at once. Customers expect (and quite rightly) that if a book is published on Thursday then it will be on the shelf on Thursday. Could publishers therefore do us a favour next year and not publish everything all at once? Would it really make that much difference if you publish it a couple of weeks early? Or later? Surely then your book would stand less chance of being lost among the other 799, in the blaze of publicity as various celebrities swarm over every talk show and news programme promoting their latest biography. I was so exhausted this week that I forgot to go to my Crime Reading Group on Wednesday. By the time I got to Saturday I was a jibbering wreck. 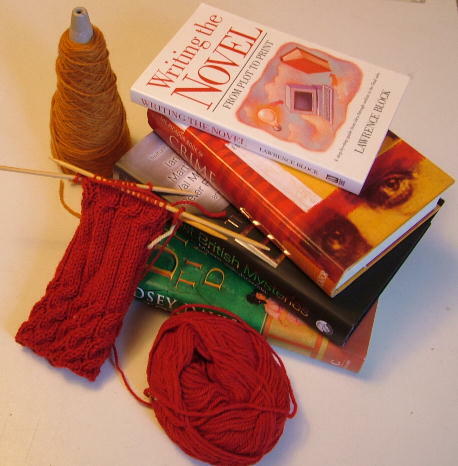 Hence there has been very little in the way of reading or knitting. I did finish the second James Sallis book, Cripple Creek. It was really good and I'm now eagerly awaiting the publication of the third book in the series, Salt River, (sensibly published by No Exit Press on October 23rd). And I've been knitting the totally wonderful Hypnosis socks (Ravelry link) from The Eclectic Sole by Janel Laidman. It's not available in the UK yet but it's a great book and there are easily 5 or 6 sock patterns that I wanted to knit right away and there's only maybe one that doesn't appeal, though it's still technically interesting. I'm knitting them in Noro Kureyon Sock Yarn which I bought in Florida and I love the colours, though like Ambermoggie, I'm having a little problem with the yarn being almost threadlike in places. I'm not sure this photo does the colours justice. The bluey/green at the cuff is fairly accurate but then it blends though a grey colour to a delightful purple and now it's turning green. Anyway the sock has been put on hold for a little while as I've been busy knitting baby bootees for a colleague and then I need to start the secret Christmas knitting this week before the general mayhem of Christmas shopping really starts to hit at work. Last night we watched Recount which has won numerous awards, and stars Kevin Spacey amongst many other wonderful actors. It's about the dreadful electoral shambles in Florida in 2000 that lost Al Gore the presidential election and landed us with the last 8 years of Bush. I couldn't help but think all the way through how different the world would be now if things had turned out differently. Anyway it's top class TV drama and I highly recommend it. Heroes is back on BBC2 - more great drama. And just in case you hadn't seen the adverts - Fringe starts tonight on Sky One - don't miss it - from the first couple of episodes it looks like it could be really good. Looking forward to seeing your finished sock! Very interesting re October date for Christmas books. My daughter was just saying there were suddenly loads of new books she wanted - just in time for the Christmas list!